Every year, firms in cities like London, Birmingham and Glasgow use factoring to help them raise the cash they need to grow their businesses. Invoice factoring is a great tool that virtually any kind of firm can use. The way it works is simple. If a firm has outstanding invoices, it can use them as security for a loan. A firm that is owed £1,000 by a client can ask a factoring firm to give it a loan secured against that invoice. How much it can borrow is partly dependant on the credit worthiness of the company that owes the £1,000. If their credit worthiness is good, it is possible to borrow up to 90% of the face value of the invoice, in which case a loan of £900 can be secured against that particular invoice. When the invoice is paid, the loan is repaid along with any fees owed for the loan. The balance of the invoice is then paid into the borrower’s account. It is possible for a firm to borrow in this way against all of its invoices, or just one or two of them. If a firm needs to, it can borrow something every month or just occasionally. Who can borrow in this way? The great thing about factoring is that it’s a product which practically any type of firm can use. The best Glasgow factoring companies are flexible about who they will lend to. Generally, they will lend to any firm that raises invoices, and this includes sole traders and start-ups. Even firms that have a poor credit rating can often borrow money in this way. There are several advantages to borrowing money in this way. The best Glasgow based factoring firms offer a fast decision on all applications. In most cases, a company will know within the day whether its loan application has been accepted or not. It is perhaps the most flexible way to borrow money. A company can borrow anything between 10% and 90% of the value of each of their invoices. With factoring, there is also the added advantage of not having to chase clients to pay their invoices. For the invoices that they have provided loans against, the factoring firm chases up any late payers. Borrowing money in this way also improves cashflow. Effectively, firms that use factoring are getting the money for their fulfilled orders in their account several weeks early. Established Glasgow factoring providers will even lend money against invoices that are raised for exported products. For UK companies that sell their goods abroad, this is a huge bonus, because they too have access to this easy to use and flexible way of borrowing money. Invoice Finance Scotland is a Glasgow based factoring company that has been lending to UK companies for several decades. 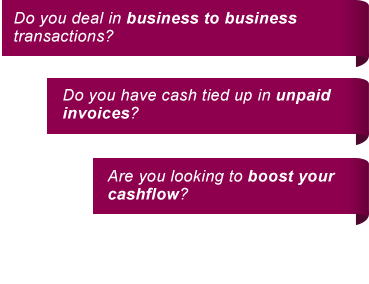 Our team is ready and waiting to explain to you how you can use invoice factoring to provide your business with the cash it needs to grow and prosper. To find out more, give us a call or fill out the quote form.